Although spending most of its time outside industrial service, the locomotive which forms the subject of our heading is more closely associated with the Club than any other, as members will realise. It has been stated that RUSSELL was originally ordered from the Hunslet Engine Co. Ltd. by a railway in India but not delivered, and that it was an enlarged version of Hunslet’s 2‑6‑2 side tank design of 1898 for the 2' 6" gauge Sierra Leone Railway. There seems to be no evidence to support the first statement. The facts are that RUSSELL’s specification was dated 31st January 1906. A firm order was placed on 13th February 1906 from his Llanberis office by G.C. Aitchison, General Manager of the Portmadoc, Beddgelert & South Snowdon Railway Company. The first new drawing was prepared on 20th March and the last on 14th May. RUSSELL was tried in steam on 26th May and despatched from Hunslet carrying works number 901 on 29th May 1906. The PB & SSR had constructed no part of its railway (nor did it ever) and the North Wales Narrow Gauge Railways Company, with which it was authorised to make connection, took delivery. The second statement is to some extent correct as RUSSELL’s coupled wheels, tyres, screw reversing gear, springs, axleboxes, coupling and connecting rods, pistons, crossheads and slidebars were of the same design as the Sierra Leone engines. Of new design were the cylinders (10¾" bore against 10"), smokebox, frames, cab, tanks (water capacity increased by ninety gallons), brakegear, bogies and chimney. The boiler and firebox were identical to those on Hunslet number 865 (built in 1905 for Leeds Corporation Waterworks) which gave 69sq.ft. more tube heating surface than on the Sierra Leone locomotives. The total wheelbase was increased by 2", and the weight by 10cwts. An additional 2½cwts. of fuel was carried in bunkers at the ends of the side tanks. RUSSELL had a cast steel “Cannon” type of pony truck axlebox which embraced the axle between the wheels in one casting, and the suspension was by means of a centrally positioned helical spring. It was not necessary for the main frames to be cut away as the side movement of the trucks to negotiate a curve with a minimum radius of 198ft. was much reduced. This side movement was controlled by swing links and not by pins, a feature more in keeping with standard gauge main lines rather than narrow gauge practice. The reason for its adoption is not known. RUSSELL was only the third Hunslet narrow gauge locomotive in this country to be fitted with Walschaerts valve gear. Another preserved engine, JACK (Hunslet number 684, gauge 1' 6"), built in 1898 for John Knowles & Co. Ltd., Woodville, Derbyshire, was the first; number 865, previously mentioned, was the second. Hunslet had introduced Walschaerts valve gear in 1886 on two 3' 0" gauge 0‑6‑0 saddle tanks (numbers 389 and 390) delivered to Punchard & Lowther for the La Guaira Harbour Corporation Ltd. in Venezuela. By the time RUSSELL came out of the shops a further seventy-three engines at least had been so fitted, but it was not until 1912 that the standard gauge merited attention when three steam railmotor coaches for the Egyptian State Railways (Hunslet numbers 1095 to 1097) were equipped with the gear. 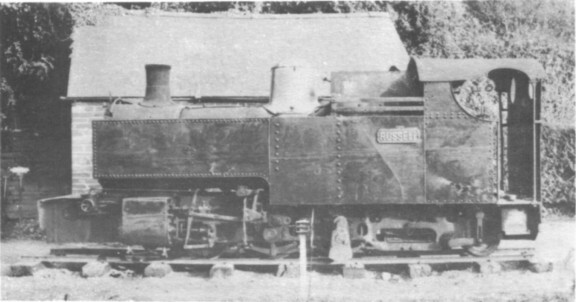 The specification was slightly amended in two parts before RUSSELL was completed; the total wheelbase became 15' 6" after being “reduced as much as possible” from the original 15' 8", while the gauge was reduced ¼" to 1' 11¼". The extreme height was not to exceed 8’ 11”, and the extreme width 6' 5" (“or 6' 6" at the most”). Spring gear compensating beams were fitted on each side between the coupled wheels which were inside the frames, while the axles were fitted with outside bearings. Detail fittings included a spark arrester in the smokebox; an ashpan with side cleaning out doors; Ramsbottom type safety valves; screw reverse; four sandboxes conducting sand to the rails in front of the coupled wheels at each end; a Wakefield sight-feed lubricator coupled to each valve chest; a Furness lubricator in the front end of each cylinder; draincocks in each end of the cylinders; Westinghouse brake (replaced by vacuum brake in 1923); hand brake; centre buffer with side chains. Upon acquisition by the Welsh Highland Railway the NWNGR was extended south to Portmadoc in 1923 and, to enable it to work throughout, RUSSELL had its cab and boiler mountings cut down. The WHR closed in 1937 and RUSSELL remained at Dinas Junction shed until May 1942 when it was sold to the Hook Norton ironstone quarries of The Brymbo Steel Co. Ltd. RUSSELL did not take too kindly to the uneven track here and was frequently derailed. Even the removal of the pony trucks did nothing to prevent this malady, and they were replaced. The end of the War brought about a reduced demand for ore, and when the quarries closed RUSSELL found a new home in 1948 at the Norden Clay Mines in Dorset of B. Fayle & Co. Ltd. Enjoying no better a reputation here than at Hook Norton, RUSSELL was converted to an 0‑6‑2 side tank. It is at this point that the Birmingham Locomotive Club comes into the picture, indirectly as it so happens. In October 1953, during negotiations for the preservation of SECUNDUS (now preserved in the Birmingham Museum of Science & Industry), Pike Bros., Fayle & Co. Ltd. wrote to say that RUSSELL had been taken out of service and was available at the scrap price of £70. If a suitable site could be found its preservation seemed practicable. The Caernarvon Town Council were unable to help, but the Talyllyn Railway Preservation Society agreed to accept RUSSELL and a Preservation Fund was opened. Club members on a tour of inspection found that a good deal of work would be required to restore RUSSELL to museum condition as it had a broken axle (the immediate cause of withdrawal) and was otherwise in poor shape. A visit to Towyn to do anything worthwhile would be a two-day job, and it was therefore decided to renovate the locomotive in Birmingham where Club labour would be more readily available. To this end arrangements were made with the Western Region of British Railways for the reservation of storage space in Moor Street Goods Yard. However, the TRPS expressed willingness to assist in rehabilitation work, and RUSSELL was therefore moved direct from Dorset to Towyn by road on 22nd August 1955. A tarpaulin was obtained to provide cover during the winter months, and in March and June the following year working parties from Birmingham visited Towyn. Some cleaning was undertaken and the broken axle removed for sending to The Hunslet Engine Co. Ltd. who had generously agreed to do the repair gratis. Unfortunately, it has not yet been found possible to provide permanent cover or restore the engine to its pristine condition, but this must surely come to pass. Cylinders : 10¾" x 15" Gauge : 1'11¼"
Tubes (Brass) : 97 of 15/8" dia. Coupled Wheels (dia.) : 2' 4"
Working Pressure : 160 lbs./sq. in. Bogie Wheels (dia.) : 1' 6"
Tractive Effort (75% WP) : 7,420 lbs. Coupled Wheelbase : 5' 6"
Water Capacity : 440 gallons Total Wheelbase : 15' 6"
Coal Capacity : 29 cu. ft. (14½ cwts) Boiler Barrel (length) : 8' 1½"
Heating Surface (Tubes) : 345 sq. ft. Boiler Barrel (dia.) : 3' 1½"
The history of RUSSELL during its stay on the WHR and at Hook Norton has been more fully chronicled elsewhere, and readers are referred to “Narrow Gauge Railways in North Wales” and “The Welsh Highland Railway” by Charles E. Lee, “The Ironstone Railways and Tramways of the Midlands” by Eric S. Tonks, and “Narrow Gauge Rails to Portmadoc” and ‘The Festiniog Railway” by James I. C. Boyd. The considerable assistance of both Geoffrey Horsman and Eric S. Tonks in the preparation of this article is gratefully acknowledged.